In the notes to today’s game between Boris Gelfand and Viswanathan Anand, grandmaster Sergey Shipov gives us some wonderful insights into the psychology of the Soviet man. (Even though Gelfand is from Israel now, he is certainly still under the influence of his Soviet upbringing.) As Shipov says, people who lived in the former USSR are most worried precisely when things appear to be going well. That’s exactly when somebody (or fate itself) will come along and blindside you. As for the opening, I am no longer certain that we will inevitably see the Meran Variation of the Slav Defense played in the Chebanenko style. Surprises are possible, and they may even be dramatic. I’d still say that Boris is most likely to open 1. d4, but Vishy might veer off to the side at an early stage. So, like Socrates, the only thing I’m certain of is that I’m not certain of anything! A brave decision nowadays! And the most principled one. The Nimzo-Indian Defense. An ancient yet evergreen opening. Its theory has tripled over the last 15-20 years. The knight on g1 retains the option tomove either to e2 or to f3. Position after 7. O-O. Black to move. The tabiya of the Nimzo-Indian Defense. 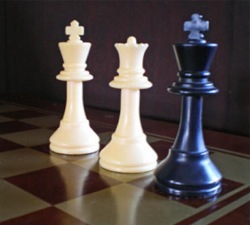 The clash of pawns in the center inevitably leads to a certain amount of simplification, in which both sides have a widechoice of possible pawn structures and piece setups. Mankind has studied this position intensively since the 1930s. Many books have been written about it, but I have to say that the best in the series is Mark Evgenievich Taimanov’s “Nimzo-Indian Defense.” Look for it! That is where you should begin. 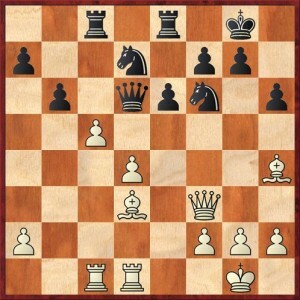 The development of the bishop to b7 strengthens his control over d5. 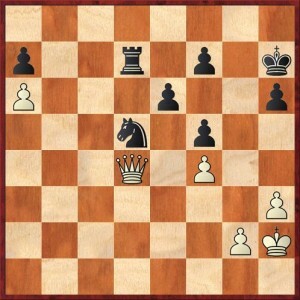 In the absence of an opposing bishop on e7, God himself has ordained the bishop to pin the knight on f6. 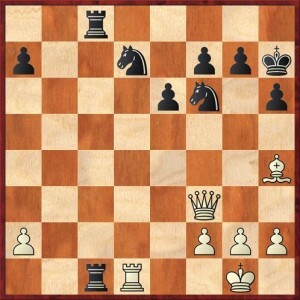 For all practical purposes this forces Black to develop the queen knight to d7, not to c6. Position after 12. Rac1. Black to move. Gelfand has been playing the opening more certainly and more rapidly than Anand. In the style of Kramnik he is putting psychological pressure on his opponent… Although there is still a question of who is playing in whose style. Kramnik is a little bit younger than Gelfand, so it’s more likely that he learned from his older colleague. Vladimir and Boris, by the way, have been friends for many years. They have prepared together for major tournaments on numerous occasions. The clock speaks eloquently about who was better prepared for the position that has arisen: 1:50 – 1:37. Vishy is thinking for a long time. He clearly does not remember what needs to be done here and how. Without concrete preparation it is extremely difficult to use only your broad knowledge of the general ideas of an opening to battle against an opponent who is stuffed to the gills with variations. On the other hand, Black’s position has an ample supply of solidity. Black has no obvious weaknesses. 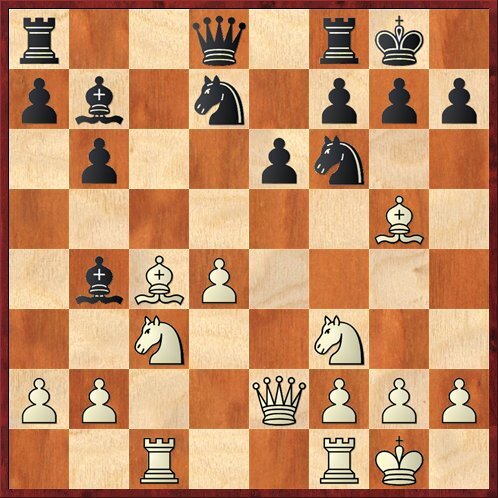 The main things to worry about are an increase in tension (for example, with Nf3-e5 and Ra1–d1) or the bishop sortie Bc4-a6. 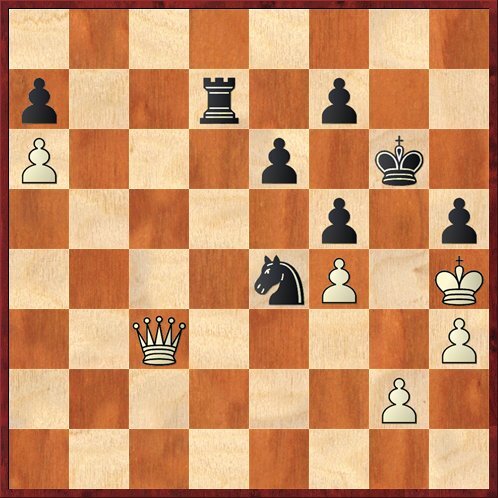 Now the Black queen has an opportunity to escape the baleful gaze of the bishop on g5. But I am not certain that the order of moves chosen by Anand is optimal. It resembles what would have happened in the aforementioned Karpov-Psakhis game if Black had played the calm … Ra8-c8 instead of the aggressive move Nf6-g4. Which, however, is not necessarily a terribly bad thing. The surprising pause by the champion speaks for itself. He is obviously not sure if he has done the right thing. One way or another, he has to play … e6-e5. Otherwise, what was the point of exchanging the strong bishop? Position after 16. ... Rfe8. White to move. Creating luft but also weakening the king’s defenses at the same time. Position after 19 c5. Black to move. Another reason for amazement! Who would have thought that such experienced title seekers would so frequently be naughty at the chessboard at the very moments when they should be the most responsible? Maybe everyone expected it but me… I still think that White should have taken the time to strengthen his position a little bit. For example, by playing 19. h3 — it could not possibly hurt to create a window. 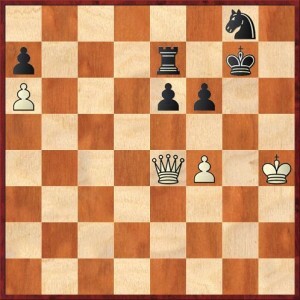 There is no option, otherwise the White pawn would charge on to c6. The opening of the file has led to a dramatic activation of the White rooks. Now the threat is to bounce the bishop from d3 to h7. Of course White has to take the queen, in order to justify giving away the pawn. Position after 23. ... Rec8. White to move. Black has gotten a rook, a piece and a pawn for the queen. The main danger for him lies in the previously inconspicuous pawn on a2. If White is able to get to the pawn on a7, then he can create a threatening passed pawn, and no matter how many powerful knights Black might place on d5, they won’t be able to hold back the one foot soldier racing down the edge of the board. However, this is really just a fantasy. I have the lasting impression that Gelfand settled for too little. He sold his gold watch for a ruble. Maybe life will dispel my illusions — I would only be glad! Anand has clearly cheered up! His despair has disappeared, and he senses that he has a real chance to save himself. Time is passing but for the moment it is not galloping: 0:46 – 0:54. Position after 28. Kh2. Black to move. The position has gotten simpler. It appears that Anand intends to hold the seventh rank with his rook, hoping for a fortress. 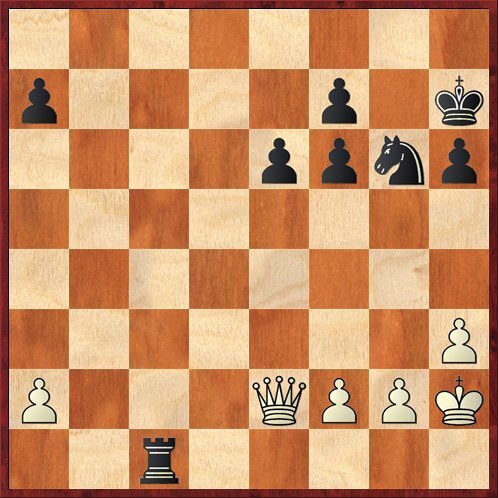 But for the moment I am not certain how strong it is… Let’s say if White places his pawn on a6, his queen on d6, and then plays g2-g3 and h3-h4-h5! 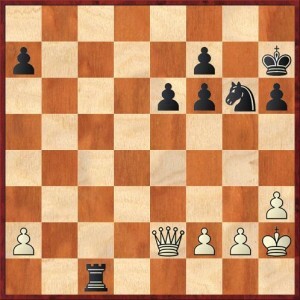 Then it might turn out that the Black rook will run out of outposts and the pawn on a7 will collapse. And in fact Anand does it. Here it is essential to scrutinize all the nuances and think a long way ahead in terms of schemes and plans. Gelfand stats to execute the plan that I pointed out. The pawn is going to a6. The battle continues! But for starters Boris completes the advance of his wing pawn. So that he can forget about it for the next 20 moves. From here on he will play with the kingside pawns. Here is one more fantasy: f2-f4, g2-g4, h3-h4 and g4-g5. Of course, making sure not to hang anything. It’s only necessary to find the best squares for the king and queen in the process… The clocks read 0:23 – 0:33. To stand and wait is the only reasonable strategy for Black in such positions. Of course, Black still believes that his fortress is indestructible. The main question of the moment is: does the advance … f6-f5 favor Black? If so, then White must immediately play g2-g4. Understanding the looming dangers, Anand tries to engage the opponent before he gets too close. Now the White pawn can never get to f5. Position after 34. ... Rd7. White to move. Not a dangerous ambush. On 35. g4 Black is planning, apparently, to play 35. … Kg6 with the intention of taking on f5 with the king! 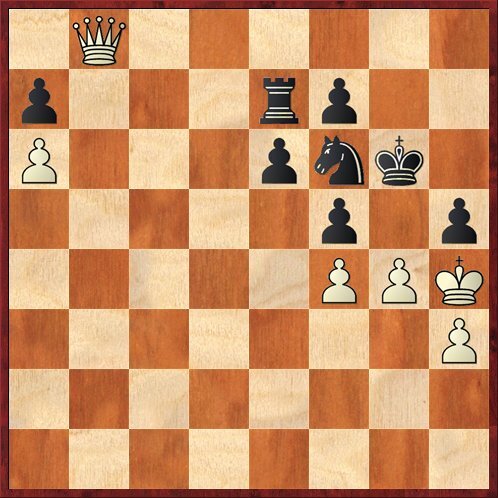 By the way, speaking of captures… How is White supposed to win if Black takes on f5 with the pawn and places his knight on f6? I don’t see any way yet… If so, then the challenger made a very serious mistake by playing 33. Qd4. It was clearly better to choose 33. g4! Now Black is completely right to stand and do absolutely nothing. The ball is in White’s court… I admit, for the first time I am seriously convinced that Black will escape with a draw. Threatening a check on g8. An easily rebuffed threat. The players have picked up the pace slightly. The clock is forcing them to: 0:03 – 0:10. Position after 37. ... h5. White to move. Wha-a-at? Why? Why does Vishy leave the square g5 naked, when White’s queen can get there? Strange… It seems to me that all he had to do was shuffle with his pieces in place. The king frees up a route for the queen. It appears that Black will have to watch over the g3 square by playing … Nf6-e4. But it’s still not clear what he is going to do when the White queen announces its presence on f3. Possibly Black will get some chance for counterplay against the dangerously placed White king. We stand, we wait, we endure. Now let’s keep a close eye on the opponent’s clock — maybe he’ll let his flag fall! Approaching g3 by a roundabout route. Position after 40. ... Ne4. White to move. The time control has passed. [Interestingly, the first time in the match that has happened! — DM] The dust has settled! It has become clear that with White’s king on h4 Black is willing and eager to lose the h5 pawn, because in that case he actually wins with the maneuver … Rd7-d8-h8! So the champion has everything under control. He simply chose this method to achieve a peaceful result. One of the advantages of this method is the fact that it has become even harder for White to carry out the break g2-g4… The draw is very close now. Boris is suffering at the board. Vishy is calm, radiant and pure, just like Buddha. The attempts to penetrate from the side fail. 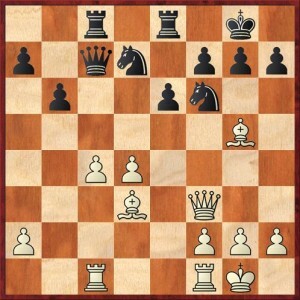 So, perhaps it’s time for White to move his king away from h4? But then he will have to reckon with the bind … h5-h4 followed by a transfer of the knight to g3. Another winning attempt would be to play the sharp break g2-g4 at the necessary moment… But I still can’t find an effective way to do this in my analysis. In every line Black has sufficient resources. Position after 43. g4. Black to move. As predicted. Gelfand tries his last practical chance. Threatening a fatal check on g5. Boris persists in his efforts to win. I think he’s sorry to give up on a game where he had such a large and clear advantage. Here Black does not face even any microscopic problems. 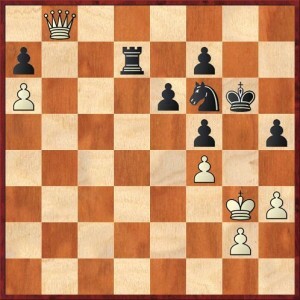 Even losing the pawn on e6 would not change aything. Final position after 49. ... Kg7. Here Anand proposed a draw. Strictly speaking, its not his business… In such positions it is up to the person with the advantage to decide whether to propose a draw or continue to fight. On the other hand, Vishy is right in the sense that the position has now become completely boring. Boris thought, thought and AGREED TO A DRAW. This game was a huge missed opportunity for Gelfand. He had serious chances to win after his opponent’s unsuccessful play in the opening. But he got a little bit overeager, grabbed his material a little bit too quickly, and then did not make the most of his chances in a superior endgame. Anand was lucky today… but it was a world champion’s luck! The score in the match remains even: 4.5 – 4.5. Only three more games with the classical time control remain. And with that, I will say goodbye. Thank you for your attention, friends. This has been grandmaster Sergey Shipov. We await further developments. Until tomorrow! I’ve corrected a few typos, caused by my haste to post this translation in timely fashion. However, the typos remain in the PGN. 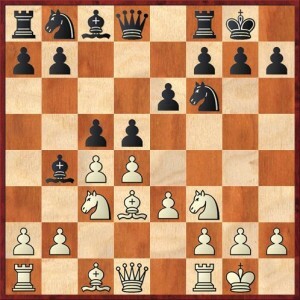 Nothing substantive except on move 34, where I mentioned a pawn going to f6 (should have been f5). In the youtube/cbv file Shipov gives a longer line with 33 g4. I’m very interested in how his evaluation at the end of the line translates (also see chessvibes.com). If you have a spare moment…? left my comment to the 9th game beneath the 100k-article. Sorry for that. Thanks so much to Sergey Shipov for commenting and to Dana Mackenzie for sharing this pearl with those, who do not master Shipovs native tongue.